Today's class hit a speed bump, as the second model scheduled for this week hung us out to dry. Fortunately, having experienced no-shows more than enough in the past, I had a backup all ready to go. This is usually the very last exercise I keep in store for the end of the semester, on the last day of instruction, and I've been springing it on classes for the past several years now. I base it off the Faulkner quote above; he gears it to writing, but I believe that along with music there are strong and obvious correlations between the creative disciplines. This has evolved into my personal favorite thing to do in the beginning class, as it provides a perfect capstone to everything we've done. 1) Lightly sketch the figure by itself centered on the sheet, leaving lots of room around the borders (caricature was also an option). 2) After that, in twenty minutes, sketch from memory an environment or setting based on any of the exercises, assignments or critiques done over the semester for this class (ex: landscape gestures, interior of a room, exterior view out of a window, art department studio studies etc.). 3) Finally, in twenty minutes, still lightly using pencil, add 1-3 objects drawn directly from reference studies out of their sketchbooks (ex: critters, plantforms etc.). These are used as fore/mid/background elements, utilizing extreme foreshortening, and here I also strongly encourage creativity. After taking a short break to review the student art show down in the department's gallery (more on that later), the class had about a half an hour to use either charcoal or markers and tie everything together/tighten up their compositions, unify the piece and also add value. Then they spun the easels around facing inward, and we reviewed the works with this in mind: present to varying degrees in all their pieces, including ones in the exhibition, will be these three factors - Observation, Experience & Imagination. I liken it to a graphic equalizer, the old-fashioned manual types (like the antique 10-channel one in my hi-fi system at home). Now typically most beginners will have to rely primarily on observation, learning how to see, analyze and represent through direct study. Over time and as their skills progress and improve with practice, experience begins to assert a larger role in the process. Imagination can simultaneously be present - sometimes compensating for deficiencies in the other two factors. Or vice-versa; perhaps the piece in question has little or none in the the way of imaginative qualities, but instead derives aesthetic satisfaction from flawless execution of the media or is rooted in traditional criteria. Ideally in some cases all three are maxed out - but maybe the relationship is dynamically attuned to each individual work as well as the artist. Point is, by this point in the class, everyone knows the "rules" and has a working, functional understanding of what goes into a drawing, good or bad, and why, and what they can take out of it as well. These pieces exemplify the three principles and perfectly illustrate them in action. A minor note of interest in this exercise is how it parallels the Native American ritual of a talking circle; traditionally when an issue is facing the village, an object symbolizing the topic is placed in the center of a circle of seated council members. By the end of the ceremony and following everyone's testimony and input, ideally every person will have gained new insight according to the perspective of the other people's view - a 360° one. The person sitting directly across from me in such a circle will be able to describe things that I cannot see. In that way the drawings after this exercise reflected a breadth and depth of everyone's respective abilities and individual talents, all brought to bear on this one drawing. I never cease to be amazed and gratified at the end results on display with this - especially something like recalling linear perspective that challenged them at the outset, some absolutely hilarious juxtapositions and brilliantly applied solutions. I had started today's session with a mini pep rally for the rejects, pointing out how "everybody's a winner" (unless one didn't even bother to submit a piece, in which case you are a loser), and if you didn't get your piece in the show, so what; if you did, so what. There'll be other shows, and more/better artwork ahead, plus dealing with rejection is a crucial skill for any exhibiting artist. This is a great opportunity to see who felt jilted over why their obviously superior piece was rejected out of favor for another much less deserving piece, and conversely spot the comparatively feeble pieces that by all rights shouldn't have even made it out of the student's drawer much less grace the gallery wall. I concur with the muttered consensus among many that there wasn't much to speak of in the printmaking and pottery/ceramics divisions; it's always sad to see such pathetic turnout and flaccid apathy amongst artists. But then again, they're no different than any other students, or people in general - in this way juried exhibitions are not unlike general elections; less than half the folks eligible to vote don't bother, and of the remaining people, usually less than half of those voters determine the "winners," which goes a long way towards explaining the quality of both politics and art shows. 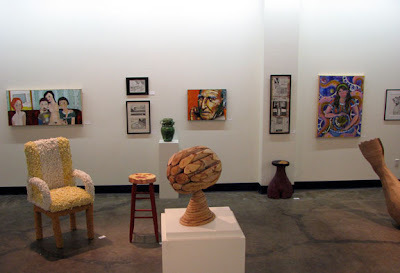 In fact, at the risk of sounding judgmental and harsh, I rank this semester's show only marginally higher than the "Up With Art" exhibit I co-jurored earlier in the season: like a high-school show only where the students had more money and time to spend on their works. That said there were some notable exceptions, at both extremes. Fifteen out of sixteen students in my class submitted works; two of those entered several pieces apiece (the limit), plus a couple more submitted two apiece. 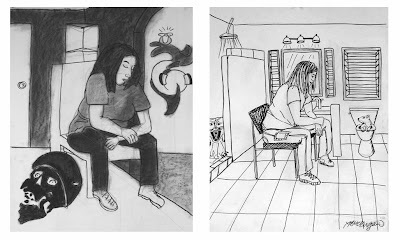 Surprisingly, only three of my students got one drawing in each; a vignette (pen & ink), a critter spot illustration (pen & ink), and one of the personal still-lifes (graphite + wash). What always baffles me is the number of outstanding, accomplished works rejected - not just from my class, but I was really impressed overall sifting through the rejection pile in the drawing studio; especially in comparison to many of the entries that were accepted. That's my own selective bias creeping in - the juror for this semester's show faced a daunting task of culling an overwhelming amount of work and did a good job with what she had. I know from personal experience just how tough it can be when there's real estate issues, just isn't enough room to select everything worth displaying. That is, after the easy part's over of weeding out and picking off the highs & lows. Also one of the criteria for these types of shows are keeping in mind it's an entire department of all different mediums and levels of abilities and styles, and should reflect that diversity to some degree. 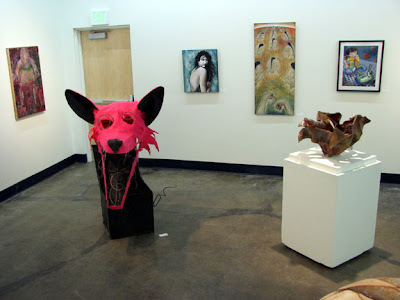 There's also quite a concerted effort on the part of the graduate gallery assistant and a faculty member along with a host of student volunteers to put this show up, a lot of hard, stressful work goes into these and it showed, no pun intended. 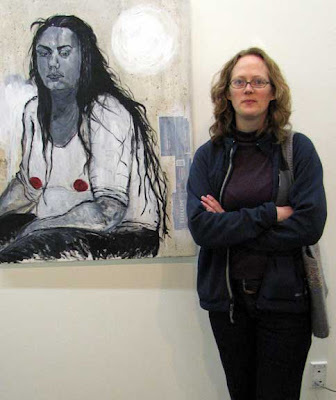 Pictured here is juror Michelle DeVaul next to the Best-of-Show piece, a self-portrait by Erin Anderson.